Most brides-to-be won’t go completely bridezilla on you and demand you wear your hair a certain way, so when it comes to bridesmaid updos, it’s usually up to you. The low side bun is totally having a moment right now. It’s romantic and classy, yet trendy. Make it young and fun with a French braid that leads into it. This look isn’t too fussy, but it’s flattering with any hair type. The French twist is no longer that dated cliche wedding updo. Updates to this standby have made it en vogue once again. End the twist in a bun, give it some volume on top, or add some bangs or messy pieces in front for a new take on this old ‘do. For a look that’s trendy and intricate, try braiding your hair into a chignon. 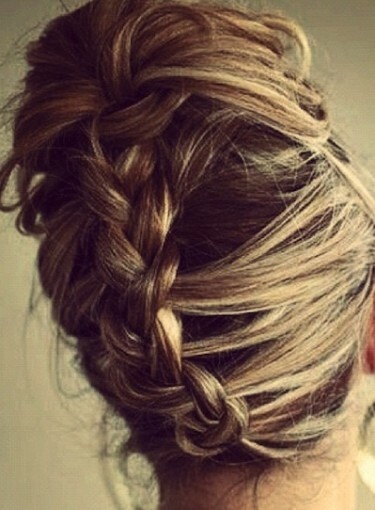 For a style that will stay in place all day braid all of your hair, including the part that makes up the bun. Whether you decide to keep your chignon high or low, this will be a unique look. It’s best to match your hair to the look of the dress you’ll be wearing. If the bride isn’t sure what she’ll have you wearing yet, send her these cute bridesmaid dresses you both are sure to be able to agree upon.